The challenge begins tomorrow, but for whatever reason, I kicked it off tonight with dinner. Lots of local goodies on this plate. Local lamb, zucchini, onions, cucumbers, and potatoes. Paired with a Maryland wine. And, if you don’t cook much. Hit the local restaurants participating in the Farm 2 Table restaurant weeks. If you want to support local farms, take the pledge. Join thousands of us eating at least one local item every day for nine days. 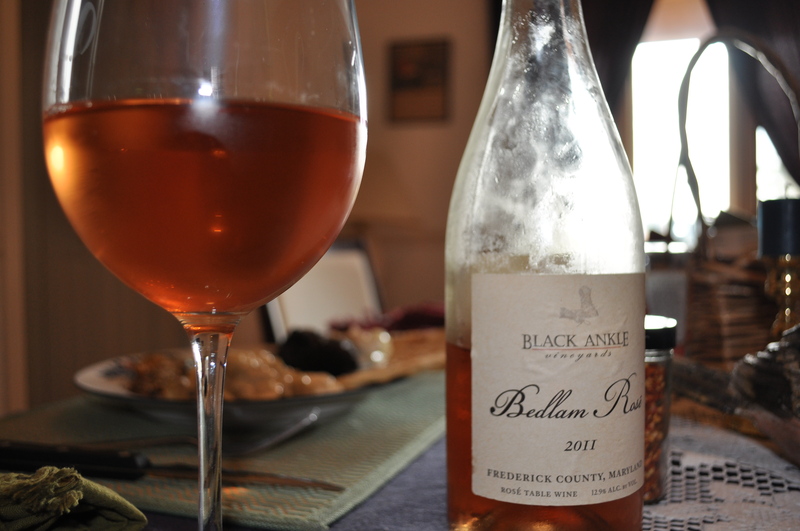 Heck, just go visit Maryland wineries, and hit a few farmer’s markets to support the local farmers. 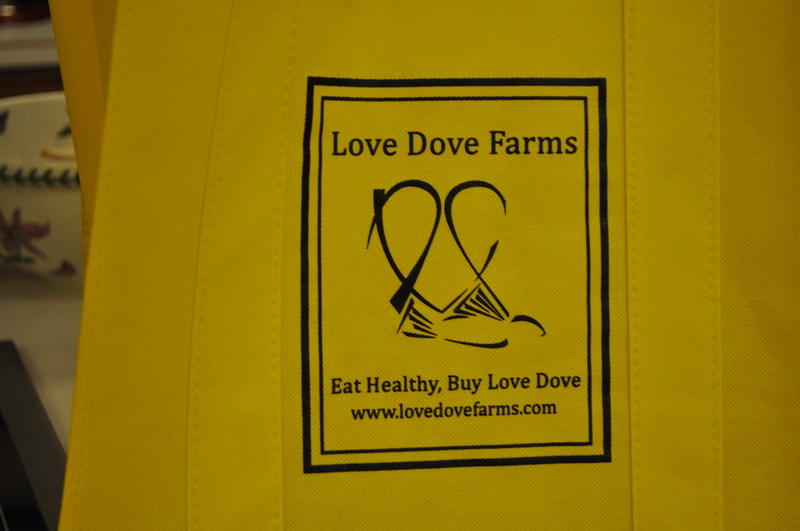 Like Love Dove. I found their new bags today at the market at the hospital. Tomorrow they are in Silver Spring, and next Wednesday at Miller Library. For me, I love getting fresh greens from their high tunnel. Today I bought arugula and spring mix. Oh, and some sun gold tomatoes since mine aren’t ripe yet. Gotta love those high tunnels. You could eat at locally owned restaurants during the week, hit a few wineries on the weekends, come to our picnic at the Conservancy next Sunday bringing local goodies. Or, you can get really into it, like me, the foodie/locavore/locapour and dine with locally sourced items for most meals. We have a picnic tomorrow to attend. I will be taking watermelon, feta and mint salad. Feta picked up at Breezy Willow. Mint from my garden. The plants were bought from local farmers. Check my blog daily for suggestions of easy ways to eat local foods, even if you don’t cook. As for those gorgeous kebabs. The recipe. Take one pound of ground lamb (I buy mine from England Acres). Generously spice it with garam masala, cinnamon and pepper. Add a teaspoon of salt if your garam masala doesn’t contain salt (Spice Island is very salty; McCormick isn’t). Add about a 1/4 cup chopped sweet onion. 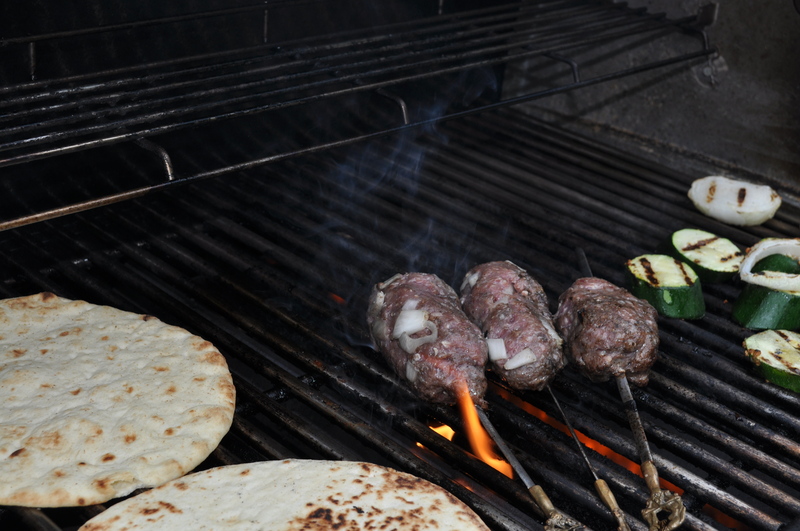 Mix it all together by hand and form around skewers. Grill until it reaches the level of doneness you prefer. I like ours medium rare to medium. Still juicy. Serve with a tzatziki. I made this cucumber yogurt dip with dill instead of mint. It works, even though it isn’t a traditional tzatziki. Posted in Farmer's Markets, Farms, Food, Howard County, Local Businesses, Locavore, Real Food, Restaurants and tagged cooking, farmer's markets, farms, Food, foodie, Howard County, local businesses, Locavore, MD Wine, wine. Bookmark the permalink. 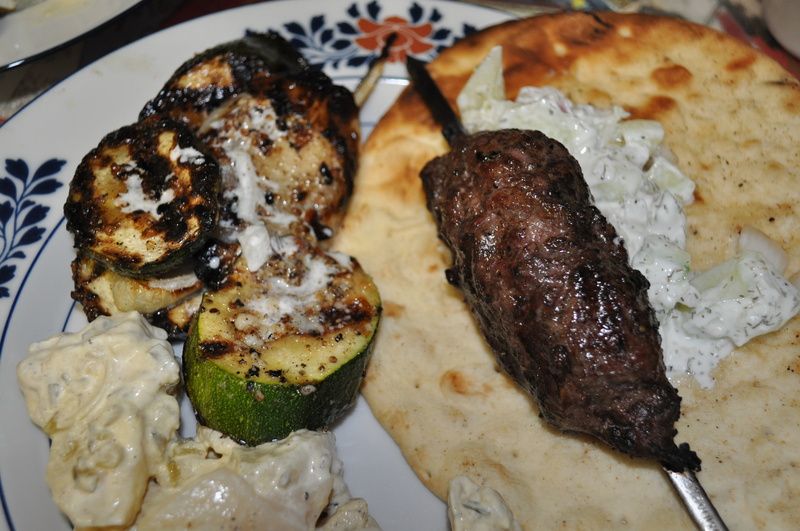 Do you have the tzatziki recipe? I chopped up one large cucumber and let it drain on paper towels. One cup of plain yogurt mixed with it. Salt, pepper, dill weed. All to taste. Traditional Tzatziki uses mint but I wanted this to be a little more savory. I’ve been meeting the local challenge every day since this year’s CSA started. Thank you for the recipes. I get lamb from the Fields of Athenry Farm in VA and so far have not been very creative in how I prepare it.